Scottie Mom: Dance, Scottie, Dance! 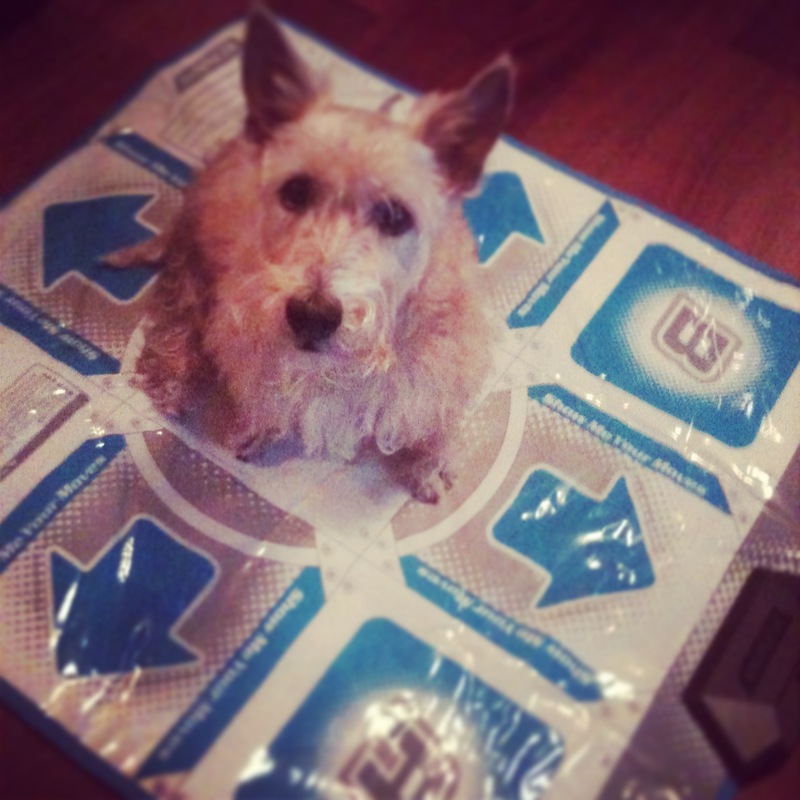 Well, with a wedding in the not-so-distant future, this Scottie Mom pulled out the old Dance Dance Revolution mat for the Wii in order to motivate myself to get into shape. Mr. K probably wasn't a bit surprised to see it again as he spent many a night in his first year watching me dance myself slim. Heather, on the other hand, came into our lives after I met Scottie Dad and thus, hasn't seen much of this magical blue and white mat. Much intrigued by it, she decided to check it out for herself when Scottie Mom stopped for a break. I hadn't left for more than a couple seconds at best. When I walked back down the hall, I saw Heather standing atop the mat on all fours, looking up at the screen. Then, she looked at me and started wagging her tail. Sensing that I was coming back to claim the mat, she sat down in the middle of it as if to say, "This is mine!" I sat down on the couch to snap a few photos of her and have a glass of water. Surely, she would get tired of the crinkly noise soon, no? No. In fact, she walked in circles again and again before finally lying down and sprawling out across the mat, marking the end of my workout. Alas, my cute Heather Bether is inspiration enough to knock off a few pounds. She's lost a total of three pounds since I adopted her nearly two years ago. All it took was some dancing of her own, too. Anytime Scottie Dad walks through that door singing, "Wiggle, wiggle, wiggle!" Heather gets to work shaking her booty faster than the speed of light. (Hence, how she earned the nickname "Shakira" from Scottie Dad.) Sometimes, they'll switch it up and Scottie Dad will sing the theme song to Rio and the two of them will go round and round, Heather shaking her booty side to side and marching along to the beat with Scottie Dad. A YouTube classic in the making? I think so! Lol, lol, lol......and the beat goes on! It's a good thing Dad loves the Scotties otherwise He'd be out in the cold and by Himself. Go Heather Go! :o)- How fun!